This is all that remains of an elegant road bridge that used to cross the Plym next to railway line. The Bridge was privately built, by John, 1st Earl of Morley, and thus subject to a toll. The first stone was laid on March 16th 1825. It was engineered by James Meadows Rendel in cast iron with foundations of granite, limestone and a water-resistant mortar. 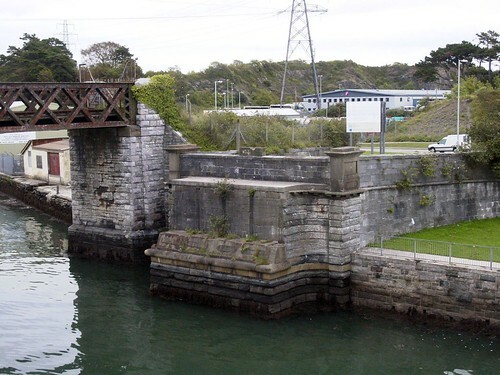 There is more on the Excellent Plymouth Data page here along with a photo of the old bridge. 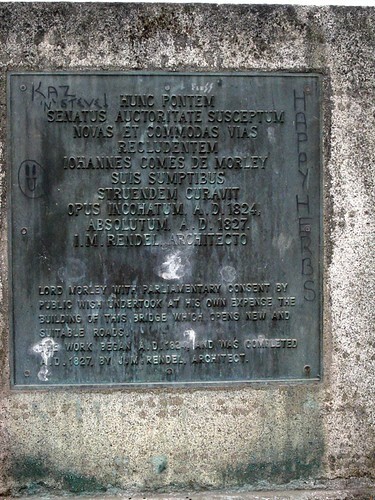 Webrarian has a photo of the original plaque on the bridge along with the script in latin.